Prepare 6 ups worth of Cavey’s Italian Sauce and set aside. Shred mozzarella cheese and set aside. Cook the Ziti according to directions on package. Be sure to cook it “a la denté” … slightly underdone, as it will continue to cooking when we get to the baking stage. Drain well. 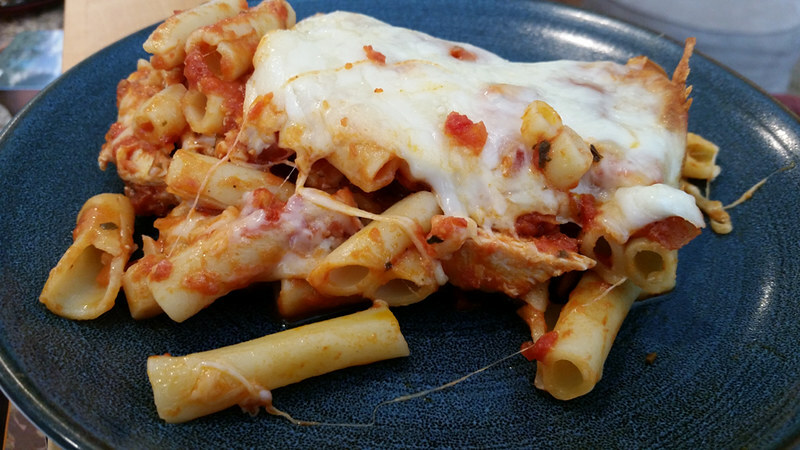 NOTE: If you can’t find Ziti, Penné, Rigatoni, or other short pasta tubes will work just fine. 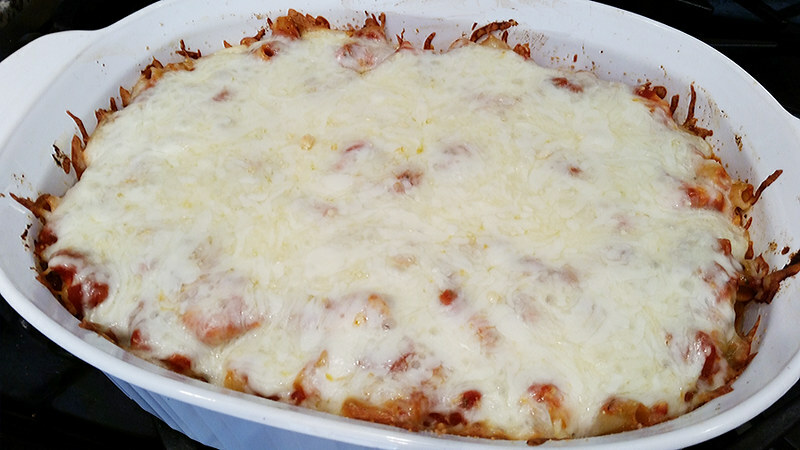 Return Ziti to pot, add 1/4 to 1/2 of a cup of the Italian sauce, and gently stir in evenly. Set aside. Cut chicken into large bite-sized pieces. In a large skillet, warm olive oil, quickly sauté garlic, add chicken, Italian herbs, and salt and pepper to taste. Cook until almost done. NOTE: Don’t overcook or it will get dry during baking. 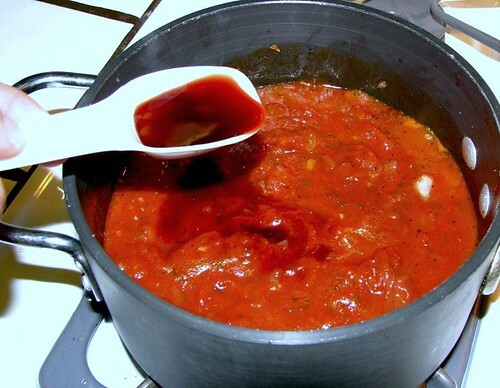 Add 1/4 to 1/2 of a cup of the Italian sauce and continue to sauté for another minute. Then, remove from heat and set aside. HINT: Once you have your sauce simmering, most of the remaining steps above can be done simultaneously. It’s a real time saver! Take a large, deep baking dish butter it well. 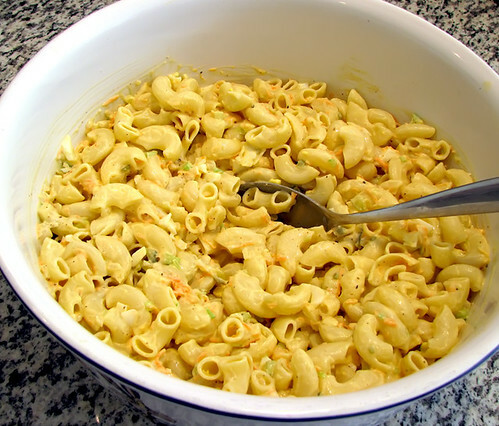 Place a layer of half the pasta evenly into the dish. Evenly distribute half the cooked chicken and cover with half the remaining sauce. Completely cover with slices of Provolone cheese. 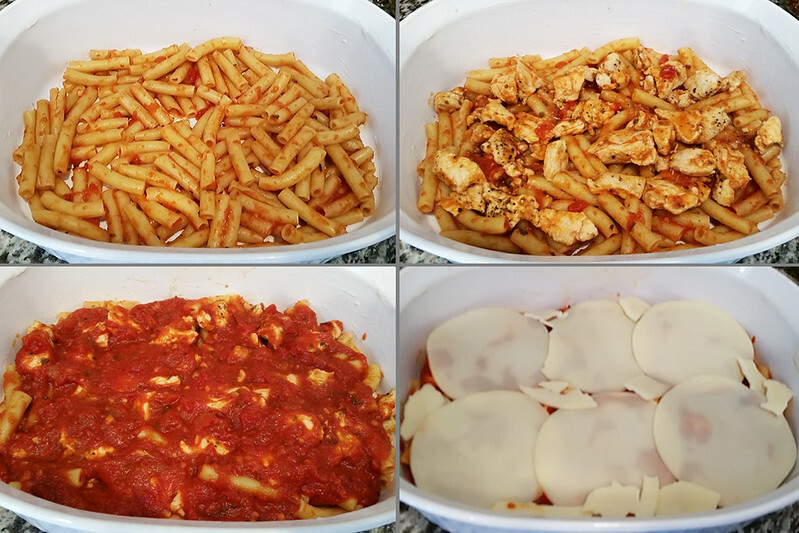 Now, evenly distribute the remainder of the pasta, chicken and sauce (in that order). Cover with Mozzarella and Parmesan cheeses. Preheat oven to 350°, cover baking dish, and place into oven for 20 minutes. Then, uncover baking dish and place back into the oven for another 10 minutes. Remove from oven when cheese begins to bubble and the edges are golden brown. Let stand for 5-10 minutes (Yes, I realize it’s difficult to not just dig in. But, you need to let it set up). Spoon into plates and serve with garlic bread and a salad. YUMMMMMMMMM! HINT: For a vegetarian version, just remove the chicken from the equation, or add Gardein meatless chicken strips, instead. HINT #2: This is a great dish to make ahead of time. You can either refrigerate it unbaked for up to 3 days, or freeze unbaked for up to 3 months. Just be sure to cover it well. ©2017 Caution: Caveman Cooking/UHearMe, Inc. All rights reserved. This recipe originally appeared on the Caution: Caveman Cooking blog at http://cavemancooking.net authored by Caveman. This recipe may be shared and reprinted as long as this entire copyright message accompanies it. Winner, Winner! Fresh Pasta Dinner!! We are extremely excited to announce the winner of our latest giveaway promotion on the C3 site. Pam Wilbur of New York has won a $200 Florentyna’s Fresh Pasta Factory gift certificate! With it, she will be able to order any of Florentyna’s amazing Fettucini, Linguini, Spaghettini, Fusilli, Ravioli, Tortellini, or other pasta varieties and sauces that will be shipped directly to her. All of Florentyna’s fresh pasta’s are made daily in their state of the art processing facility with 100% durum wheat (semolina), pasteurized eggs and purified water – NO PRESERVATIVES. NO ADDITIVES. NO COLORINGS. Congratulations, Pam! By the way, Pam is not only a regular reader and commenter here on C3, she also pens her own wonderful food blog at Bored Cook In The Kitchen. I think you’ll find her irreverent humor as delicious as her food. Stop by and check it out! We also want to thank everyone for the hundreds of entries we received. The response to this giveaway was amazing. THANK YOU! We are extremely excited to announce our latest giveaway promotion on the C3 site. We have teamed up with Florentyna’s Fresh Pasta Factory, purveyors of the freshest all-natural pasta, to offer one lucky winner a $200 Florentyna’s gift certificate! They’ll be able to choose from any of their fresh pastas, made daily in their state of the art processing facility with 100% durum wheat (semolina), pasteurized eggs and purified water – NO PRESERVATIVES. NO ADDITIVES. NO COLORINGS. They also offer an array of fresh sauces to compliment any of Florentyna’s amazing Fettucini, Linguini, Spaghettini, Fusilli, Ravioli, Tortellini, or other pasta varieties. Entering is easy-peasy, as all you have to do is reply to this post with the words “I Want Pasta” and you will receive one (1) entry into the grand prize drawing. Want more chances to win? We’ve got that for you, too! You can receive an additional single (1) entry by following Caution: Caveman Cooking on Twitter, and another single (1) entry by following Florentyna’s Fresh Pasta Factory on Twitter (you must have a Twitter account to follow and receive these entries). An additional two (2) entries are available for anyone who subscribes to the Caution: Caveman Cooking blog “Email Subscription” (NOT the comment/replies subscription). Another two (2) entries may be earned by browsing the Florentyna’s Fresh Pasta Factory online store, copying the URL/page address of your favorite pasta they offer, and pasting it in your comment/reply here. Finally, another two (2) additional entries may be earned if you join Florentyna’s Free Pasta Club, available only through their website. A maximum of 9 entries are available to each visitor to the C3 website who choose to enter. Please, be sure to mention in your comment/reply which additional entries you are seeking to qualify for so that we may follow up and credit you accordingly! If you are seeking to qualify for any “Twitter” entries, you must also include your Twitter name in your comment/reply. You must put all of those entry methods into ONE single comment/reply … multiple comments/replies will not be accepted! The entry deadline for this promotion is 11:59 PM PDT on Sunday 10/31/2010. At that time we will draw the winner at random from all verified entries received before the deadline. The winner will be announced within seven (7) days of the promotion’s end. We hope everyone enjoys the “Want Pasta? Giveaway”, and we thank you for visiting C3! 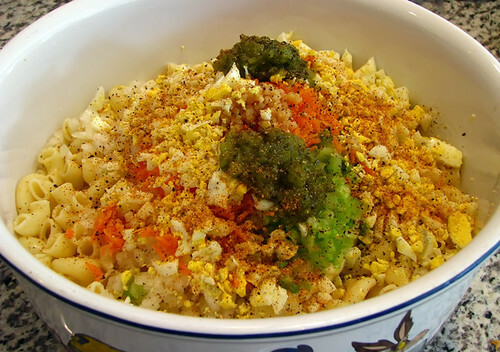 This recipe won Post of the Day for 4/8/10! NOTE #1: With barbeque season rearing it’s flavorful head, I thought I’d share this family favorite. 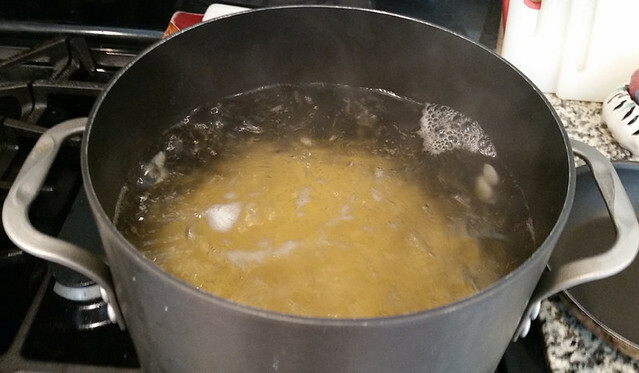 Boil pasta as per directions on package – strain and rinse in cool water. While boiling water and cooking pasta, chop onions and celery, shred carrot and mince garlic. Set aside. 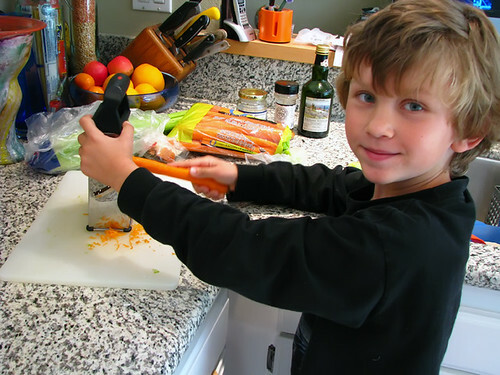 One of the best tips I can give you for this recipe is to get yourself a willing (and cute) sous chef. Here, the Caveboy is demonstrating great shredding technique. 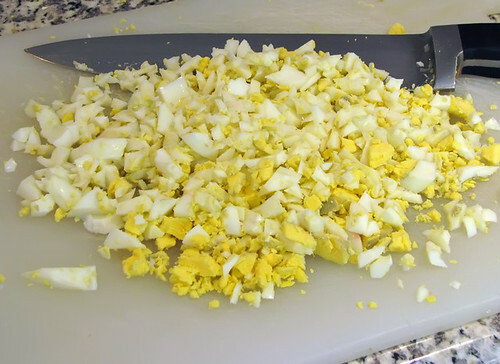 Once pasta has cooled, chop hard boiled eggs. If you chop them too soon they tend to get a bit dried out and rubbery. Briefly set aside. NOTE #2: This is a great utilization for some of those leftover Easter eggs. 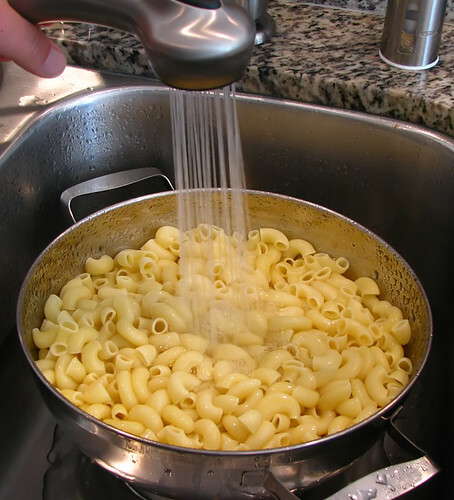 Place pasta and all ingredients into bowl and mix well. Cover and refrigerate at least 2 hours – overnight is better! HINT: Scoop some onto your plate. Then, drizzle some Killer BBQ Sauce on top … Mmmmmmmmm MMMMMMMM! TASTY!!! This also works as a great side for Asian and Hawaiian BBQ dishes. It’s official! We’re moving!! So, I have been given a “request” by the Cavewoman to empty the freezer before we move in 45 days. The pressure is on! 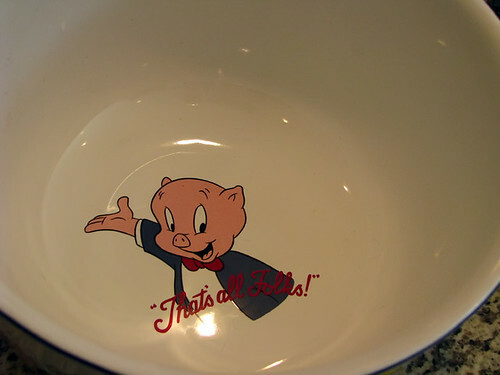 I’ll be chronicling each meal pulled from it’s frozen vault and thrust into the meal-time limelight. We’ll see if we can actually empty the freezer before zero hour! At the very least, we’ll have some fun and flavor along the way. For the first meal, I yanked a package of Florentyna’s Fall Harvest Squash Round Ravioli out of it’s chilled lair. 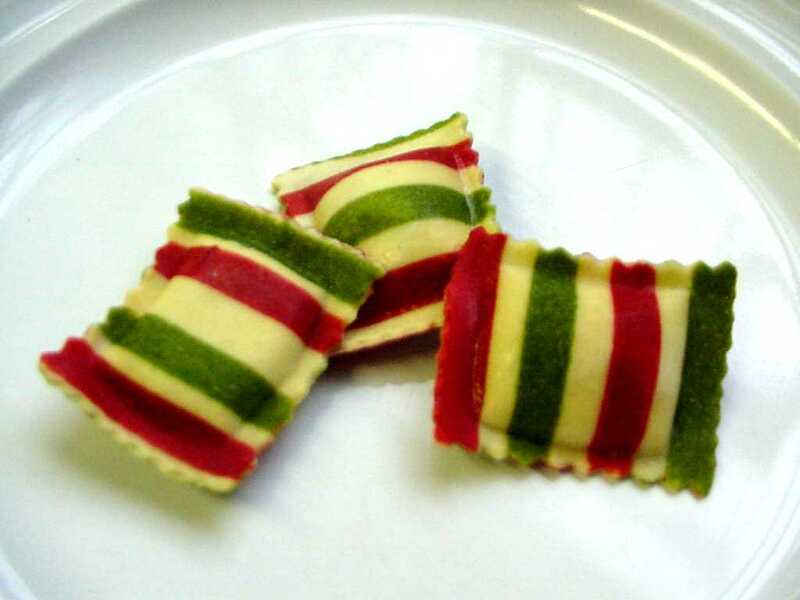 If you haven’t sampled Florentyna’s assortment of fresh-frozen pasta creations, I highly recommend you give them a try. When you don’t have the time or inclination to make your own pasta, their fresh varieties are the perfect substitute. 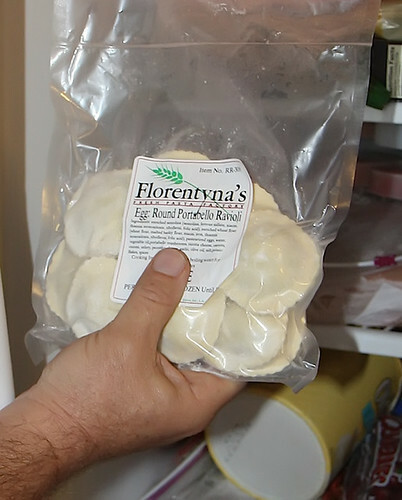 In the interest of full disclosure, you may notice that I am actually holding a package of their Portabella Mushroom Round Ravioli in the picture. The shot of the Squash Ravioli just didn’t come out. So, you are likely to see this same shot again when we attempt the shrooms. Still the question remained, “What to do for a sauce?”. My Italian Sauce just seemed too heavy to go with the delicate flavors of the Kobocha and Butternut squashes. 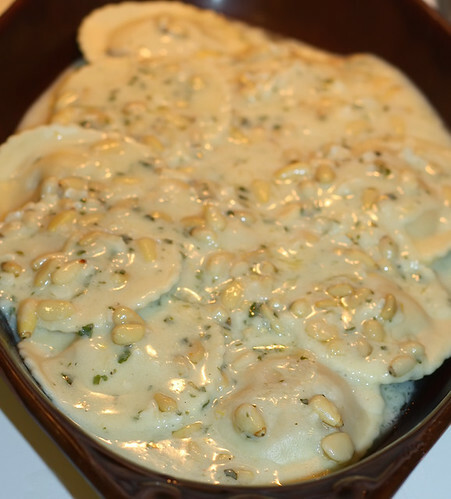 My tiny Cave-brain started spinning … butter, garlic, basil, pine nuts in some sort of creamy sauce sounded perfect. So, I went at it and ended up with a new recipe: Creamy Pine Nut Pasta Sauce. The reviews were incredible! The Cavewoman said “I don’t want to have to swallow it … it’s that good! The best I’ve ever had!!”. The Caveboy gave it “1000 thumbs-up!”. While the Cavegirl mumbled, with her mouth full of ravioli, something to the effect of “Me too!!!”. So, the first installment of the Freezer Food Fest was a success. I’m just hoping I haven’t set the bar too high for the rest of this Herculean undertaking! ©2009 Caution: Caveman Cooking/UHearMe, Inc. All rights reserved. This originally appeared on the Caution: Caveman Cooking blog at http://cavemancooking.net authored by Caveman. This may be shared and reprinted as long as this entire copyright message accompanies it. Traditionally known as “gravy”. Commonly known as “pasta sauce”. But, I call it “Italian Sauce” because it can be used on so much more than pasta! 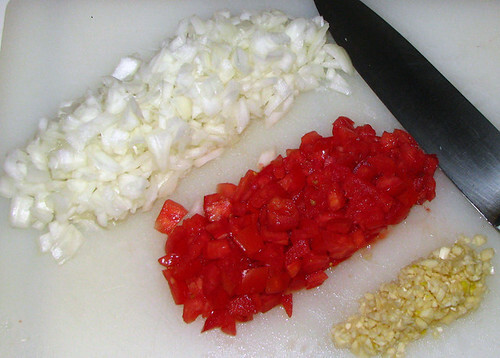 Chop onion and tomatoes, and mince garlic. Set aside. In a medium/large sauce pan heat oil. 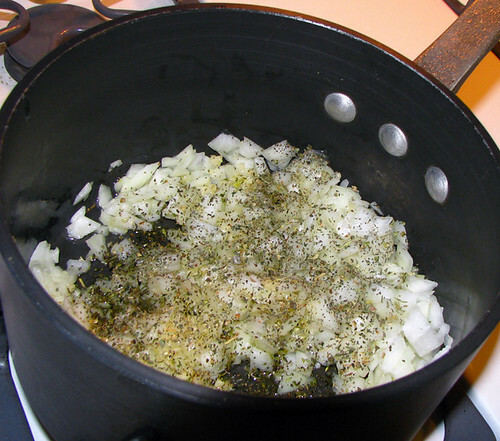 Then add garlic, onions and ONE tablespoon of the Italian Herbs, saute until they start to become translucent. 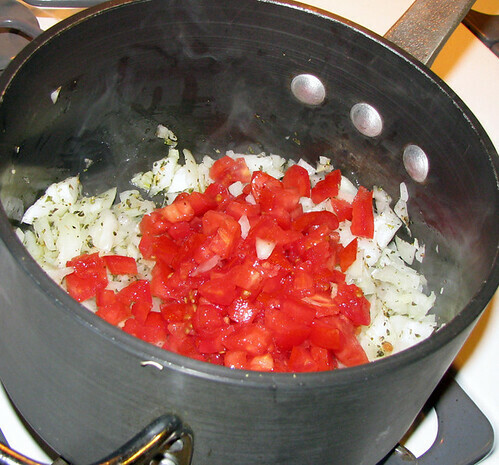 Add tomatoes and continue to saute until they become soft. Add tomato sauce, tomato paste, wine, chili pepper, remaining Italian Herbs, garlic salt and pepper and stir well. HINT #1: In a pinch, you can substitute a 30+ oz. 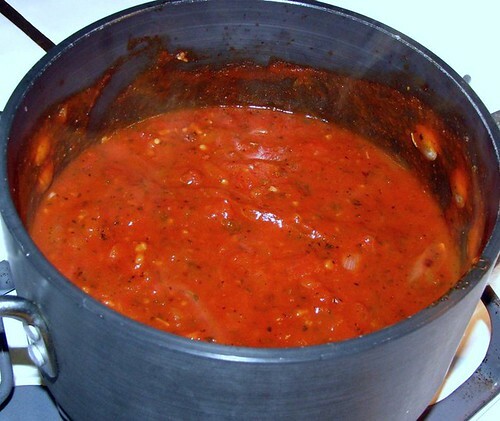 bottle of basic pasta sauce instead of the tomato sauce and paste. If you do, omit the salt, pepper and 1/2 a teaspoon of the herbs. Cover and simmer for at least two hours (the longer the better) over the smallest flame possible. Stir often. 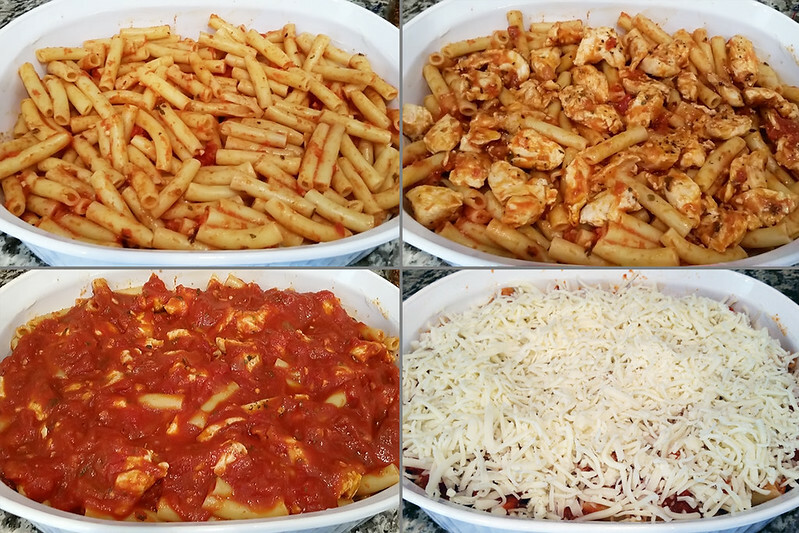 Serve over your favorite pasta, use in your favorite lasagna or chicken parmesan recipe, or makes a great sauce for homemade pizza. HINT #2: While this version is veggie-friendly, the carnivore crowd will be pleased to know that browning a pound of ground beef in the oil, onions, garlic and herbs (just before adding the tomatoes) turns this into a great meat sauce. You can also add some grilled Italian sausage or homemade meatballs to this sauce 1/2 hour before serving over pasta for a great main course.